The East Coast Doughboys are invited to the Ninth Annual In Flanders Fields Memorial. 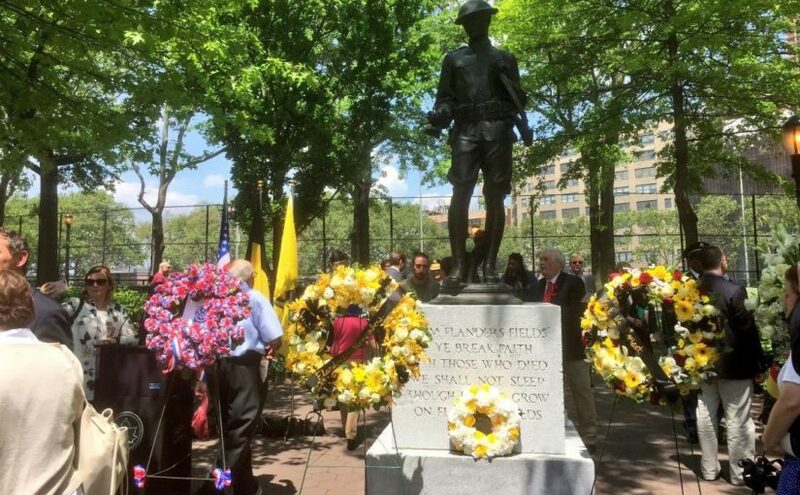 The ceremony will be held on Thursday, May 24th at 10:00 AM at the Clinton War Memorial at DeWitt Clinton Park on the corner of 52nd Street and 11th Avenue in Hell’s Kitchen, Manhattan. Doughboys and women reenactors are invited. The event is held at the Flanders Field Doughboy memorial. This is a 1930 sculpture by Burt W. Johnson that has the John McCrae poem on the pedestal. This annual event is produced by the Consulate General of Belgium, the General Representation of the Government of Flanders to the USA. We are their guests and invited to the post-ceremony luncheon. We will take part in leading the ceremony. Details are forthcoming. Uniform: M1912/1917 wool tunic and puttees.